Niche line Nomenclature "celebrates design in perfume chemistry by showcasing today’s most inspiring, exclusive molecules." The Nomenclature line presents synthetic perfume ingredients. I have a hard time thinking of an "inspiring" new scent molecule! Please comment if you have a favorite! While natural essences bask in the limelight, synthetics are the clandestine infiltrators that spark off fragrant revolutions. It was the discovery of coumarin that yielded the first modern perfume, Fougère Royale, in 1881. Aldehydes lent their abstract sheen to Chanel N°5. Ethyl-vanillin enhanced Shalimar’s plush cleavage. Hedione® breathed its radiance into Eau Sauvage. And no contemporary scent could do without synthetic musk or the ubiquitous Iso E Super. Whether they imitate nature, tease out its innermost secrets or veer off into botanically impossible smells, synthetics are the true building blocks of perfumery. Elegant solutions discovered by scientists, wafting from labs onto skin and into your nose. One certainly would expect such talk from firms like Firmenich who developed and patented Violettyne®, the focal ingredient in Nomenclature Lumen_esce. ...a preternaturally bright violet with a metallic vibration, edged in fluorescent green.... Boosted by a cool-as-cucumber essence of violet leaves, the sizzling Violettyne® shoots high-voltage current from bloom to roots. Petals aquiver, the flower scatters scented powder on a springtime posy (freesia, jasmine, iris and rose). Patchouli Prisma, a high-tech natural ingredient distilled and reassembled to enhance its woody warmth, sheds black light on the radiant bouquet. A-hem. After smelling many scents from the Nomenclature line, all I can say is: they don't make synthetics like they used to! Lumen_esce starts with hard-edged, sweet violet, a combo of leaf and "flower." The dominant note is Violettyne and it may "quiver" a bit, between the opposing aromas of staleness (old violet soap in a musty drawer with some unwashed clothes) and soapiness (a clean, lady-like violet soap scent). I found the entire perfume dull and it (thankfully) disappeared within four hours of wear. The aforementioned Patchouli Prisma is so sheer and scrubbed clean I can barely smell it (to call the note "patchouli" is a joke). Most often, I like my florals to be pungent, indolic scene-stealers, so this type of demure, unnatural violet does not appeal, but if you're looking for a new violet perfume, do give it a sniff. Nomenclature Lumen_esce was developed by perfumer Frank Voelkl. 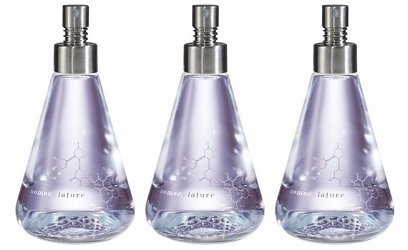 It is $165 for 100 ml Eau de Parfum at Aedes, Indigo Perfumery or Twisted Lily. In Germany, try First in Fragrance. Royal Violets has been used for decades to scent babies and the fragrance's opening conjures weird associations with infants for me: there's an unpleasant light floral-chewy medicated pacifier accord (really discernible up close). As the "pacifier" dissolves, the floral component (soft, a teensy bit musky, but not smelling of violets at all to my nose) turns powdery and is joined by sugary vanilla-scented talc. This phase is pleasant and certainly a scent fit for babies. 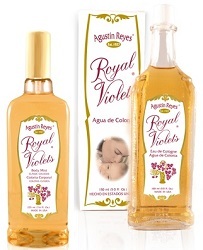 Royal Violets lasts all day on my skin but is a barely-there cologne. Is Royal Violets something that will interest adults...or perfumistas? Let's just say I'm happy my big bottle (150 ml) cost only $9. I may put it in a spray bottle and fortify it with a nice dark-vanilla bean oil and use it this summer as a room freshener. So far, no violet perfume has replaced my adored Geo. F. Trumper Ajaccio Violets. Please comment if you know of a bright, green, vibrant violet scent I should try (no vanilla, tonka bean or white musk need apply). I didn’t exactly hate Lumen-whatever, but it certainly didn’t live up to the copy. (What a shocker) But as we say here, I’d take a bottle if it fell into my lap. Have you tried Blocki, For Walks? I wouldn’t say it is a fully violet fragrance, but the violet is there, and it’s bright and somewhat green to my nose. Scentalicious, indeed a shocker ! Ha! And, nope…have not even heard of thar perfume. It’s always scary to me to read the phrases “preternaturally bright” and “fluorescent green” in the same sentence describing a perfume! I’m surprised given this description it didn’t last. But thank goodness as you said! Interesting back story on Royal Violets; I’ve never even heard of it, but it sounds like I haven’t missed much! With either of these. Thanks for taking one of the team, Kevin. My favorite violet btw is Guerlain’s Meteorite, a slightly green, fresh violet. No white musk (at least that I can detect and I loathe it) and certainly no Guerlainade. But still, I doubt it’s for you. Rappleyea, I thought Guerlain Meteorite was makeup! Meteorites is indeed face powder. However, there was a lovely Guerlain fragrance with the same name, which has been discontinued. I love it but do not find it either green or fresh. I find it a powdery violet (I think it is supposed to smell like makeup), and it reminded me a lot of Metallica, only with violet instead of carnation. And to me I did smell the characteristic Guerlainade. Who knows, maybe this is all a skin thing? Regardless, it’s not easy to find this scent, and what’s available is super pricey. Suddenly, thanks for the info! Why don’t they take the easy route and call it violets on acid? Kevin, were you a fan of Violet Blonde? It’s one of my favorite in your face violet. I also love the demure Balenciaga Paris. Laura, those two weren’t violet enough for me! I guess a soliflore is what I’m after…i’ll know it when I smell it, right? L Artisan Verte Violet, perhaps? Rudely butting in. I don’t find Verte Violette very violet-like. A green violet would be The Unicorn Spell by Les Nez. Not sure if its still in production, but it is as precious as its name. Love The Unicorn Spell! And Dawn Spencer Hurwitz’s Celadon is a gorgeous green violet. des esseintes: I think I have a sample of Unicorn Spell around the house…will look into it. Scentalicious: so sweet of you, but I don’t need to know of a violet that no longer exists! HA! I looked at L’Artisan’s site and it’s not listed anymore. Scentalicious…hasn’t that one bit the dust, so to speak? It could be; I have the 100 ml bottle, so I’ve never worried about it. May I send you some? Maybe Jeffrey Dame will offer a violet soliflore He has created some beauties! Laura: I’ve had good luck with that brand! I’ll keep looking. What about the the CB:IHP violets? I hacven’t sniffed Wild Pansy or Room with a View for years, but I remember them both being green violets. I am partial to Violet Empire with leather and patchouli. I can’t remember any white musk in them. monkeytoe: Good ideas…can’t find Room with a View though…maybe discontinued. Lush Kerbside Violet is violet with violet leaf, no sweetness at all. cazaubon: Just read Robin’s review of Kerbside…will give it a try. Late to party, but Lush’s Sunny Day hair product, which was all but useless as a product on my hair, is a wonderfully earthy, almost savory violet. I think Jessica reviewed it not too long ago. I finished my bottle but plan to buy another as a hair scent. I was about to suggest Kerbside too. I LOVED the description of Lumen_esce and the bottle (in the photos, anyway), but I can hardly smell it. Their Paradisone one (some variation on infloresce) smells very pretty, but the kind of person who would want to smell like that would want a girly bottle, I think. In terms of molecules, those IFF Speed Smelling sets are full of clever compositions intended to showcase new materials. Luckyscent has one, I think. The ideal approach would be to get together with other perfume friends and share a set. I remember Yardley as a really strong violet back in the 60s, but I haven’t revisited it. Once I found SL Bois de Violette I stopped looking. Nonetheless, having read the description of Marlene Dietrich’s violet perfume, Vielchen, by Frau Tonis, I’m tempted to order a sample. noz: don’t! I tried the violet “Dietrich” and it was way too womanly for me…was not memorable. Ah…Bois de Violette…a good one. Thanks, Kevin, good to know! What? They put chemicals in perfume these days? I never heard of violettyne before but apparently its more of a violet leaf-note. I prefer good old alpha ionone myself. Des esseintes: the older, most cancer-causing, guaranteed to irritate skin synthetics — the better then smell! HA! Kevin, what about Penhaligons’ Violetta? That seems like it would hit your bright, green musk-free violet checklist. mrsdarcy: I’ve almost given up on Penhaligon’s…if I see it in a shop I’ll try it for sure. Thanks. Sadly, Penhaligon’s Violetta was discontinued back in 2015, I think. I never got my sniffer on it. FearsMice: the age of extinctions!